Conductors for deepwater wells are traditionally installed from drilling rigs using connectors and multiple pieces of pipe. In this method, a subsea jet flushes out the soil and creates a cavity for the conductor to be installed. Jetting disturbs the soil and for this reason, it can increase the setup time before the conductor is ready for the drilling operations. In addition, the holding capacities of the conductors installed using this method are unknown because reconsolidation rates fluctuate widely in various soil types and water depths. The conductor is held in place by the rig while the soil reconsolidates (i.e. 6-30 hours rig time) and even so, many times the conductors have marginal holding capacities when the next phase of the well installation begins. Problems that sometimes can occur include not meeting the verticality tolerance requirements. 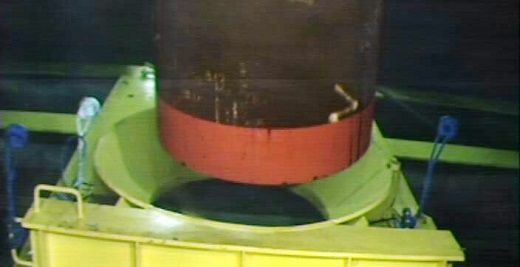 Due to poor visibility and the difficulty of knowing how deep the jetting head is disturbing the soil during the jetting process, the final length of the installed conductor protruding from the seafloor (i.e. “stick up length”) is often very difficult to control with precision. Some installations require greater accuracy for these “as-installed” parameters than can be achieved using traditional methods.